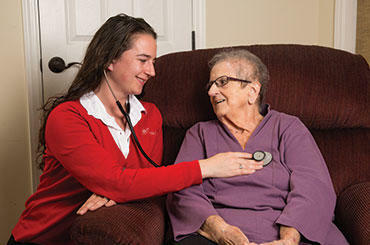 BAYADA Home Health Care in Rutland,VT provides personalized adult home care services for people diagnosed with a chronic or catastrophic illness, injury, or disability. We improve the lives of our clients and their families by providing excellent medical and rehabilitative care services that alleviate pressure, confusion, and worry, give you peace of mind, prevent complications and hospitalization, and help you achieve the best possible outcomes. Our adult home care is provided by skilled registered nurses (RNs) and licensed practical nurses (LPNs) whose training and experience are carefully matched with clients to meet their personal needs. Every BAYADA client is supported by a care team that includes nurses, a dedicated client services manager, and an expert clinical manager available 24/7 to answer questions and provide real-time support. Our one-on-one approach to nursing allows for the highest levels of compassion, clinical excellence, and reliability you deserve. We respect your wishes and take the privilege of caring for you at home very seriously, and we’re committed to earning your trust with every visit. Call BAYADA anytime, 24 hours a day, 7 days a week. 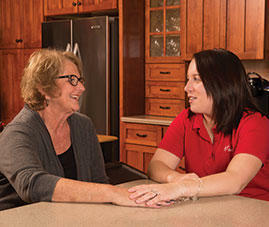 We will be happy to answer your questions and help explain our services and your insurance benefits. Friendly staff members in our Rutland office are ready to provide you with the highest quality adult home care services available. Call us now at (802) 674-1033, or fill out the form on this page to contact us.